Chicken Dak Bungalow has its roots in the British era. During the British Raj in India, Dak Bungalows were built as rest houses and used for providing lodging facilities to Government officials and sometimes for other travellers. During their stay in the bungalow khansamah (steward) used to prepare meals with the local fresh produce in country style cooking. A standard meal would include steamed rice, dal, green salad, vegetable curry or a stir fry of veggies, Chicken or Mutton Curry and a dessert. 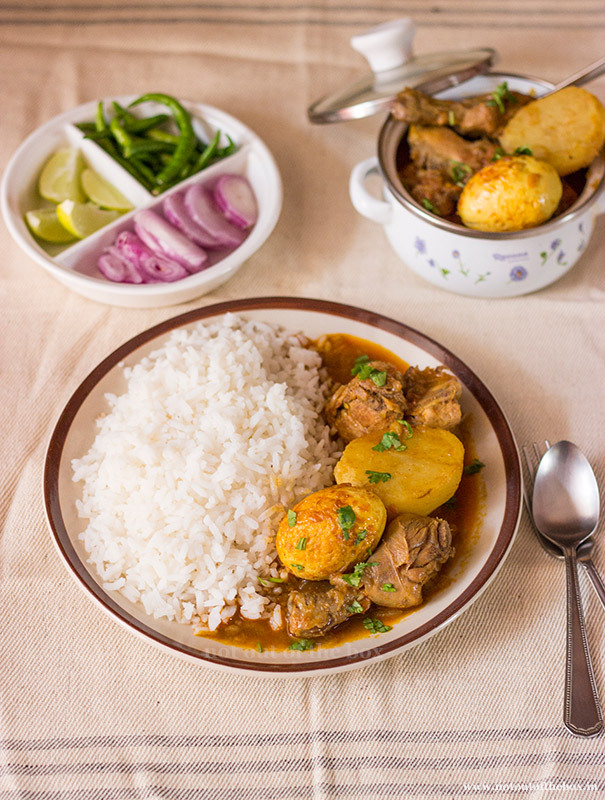 The addition of eggs and the use of whole spices was the speciality in a Dak Bungalow Chicken/Mutton Curry. Nowadays we don’t use whole spices for regular cooking, grinding the spices with a little bit of water and using that spice paste instantly for cooking was a thumb rule in old style Bengali cooking. Spices like cumin, coriander, and red chillies always used in the past after making the spice paste. This Chicken Curry has many versions as it’s a popular one, I’m sharing my version here. It’s a simple and hearty Chicken Curry which goes well with steamed rice but can be served with Roti also. Chicken Dak Bungalow is an old style Chicken Curry developed during the British Raj in India. 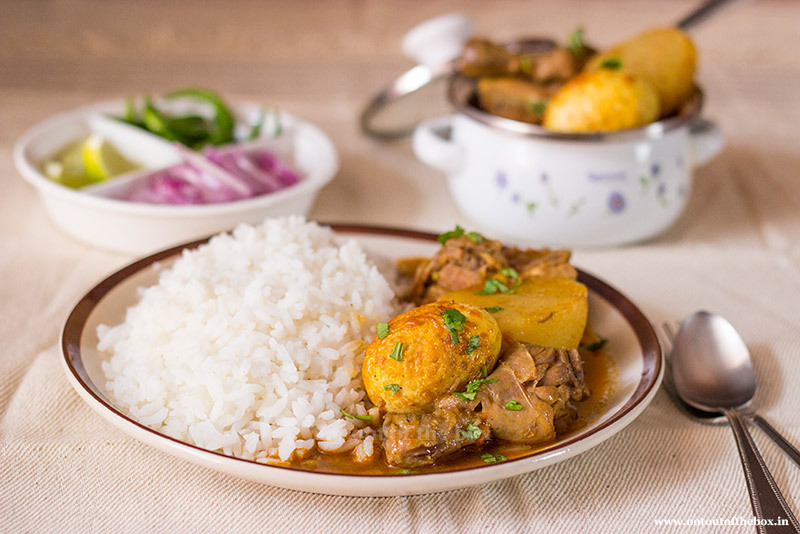 It's an aromatic chicken dish tastes great with steamed rice. Peel the potatoes and cut into halves, wash and keep aside. Add everything in a bowl mentioned for ‘marinate’ with the freshly washed pieces of chicken. Mix well; keep aside for 3-4 hours. Mix some turmeric powder and salt with boiled eggs, keep aside. Heat oil in a deep frying pan/kadai, add boiled eggs and fry over medium heat until golden in color. Remove and keep aside. Next to add the potatoes, fry them until golden, remove and keep aide. In the remaining oil temper with the ingredients mentioned ‘for tempering’. Add onion, sauté on medium heat until light brown; next to add green chillies, turmeric powder and kashmiri mirch powder. Mix well; now add the marinated chicken and potatoes into this. Mix, cover and cook over low heat. Stir in between. Add salt along with ½ cup of hot water when the chicken is half cooked. Mix well, cover, and cook further. When the chicken is almost done add sugar, and garam masala powder. Mix gently and simmer until thoroughly cooked. Add fried eggs, and garnish with coriander leaves. Your delectable Chicken Dak Bungalow is ready to serve. Enjoy this hot with steamed rice! Hi, Chandrima, I love chicken and after going through this post I tried cooking it myself. My friends came to my house for a get-together and I offered this as a surprise to them. I am posting this comment as a thank you message to you from my friends, they liked it very much. Thank you for getting me applauded by my friends. Looking forward to knowing about more recipes.